Just three ingredients transform into airily elegant little desserts for a cool ending to a dreamy midsummer night. Add boiling water to gelatin mixes in medium bowl; stir with whisk 2 min. until completely dissolved. Stir in COOL WHIP until well blended. Refrigerate 3 hours or until firm before cutting into 36 squares. 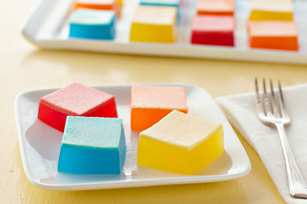 Serve these colorful fun-to-eat treats at your next party. Prepare using your favorite flavor JELL-O Gelatin. Garnish with fresh strawberries just before serving.